An intertextual space (videos, pics, articles, etc.) for Biology students. The imaging and topographical information in this processed view come from the High Resolution Imaging Science Experiment (HiRISE) camera on NASA’s Mars Reconnaissance Orbiter. These dark features on the slopes are called “recurring slope lineae” or RSL. Planetary scientists using observations with the Compact Reconnaissance Imaging Spectrometer on the same orbiter detected hydrated salts on these slopes at Horowitz Crater, corroborating the hypothesis that the streaks are formed by briny liquid water. What does this mean for life? Does this discovery boosts expectations for martian life? Should we go up there? If so, what measures do we have to take once we reach these salty slopes? This entry was tagged Astrobiology, Chapter 5: Macromolecules, water. Bookmark the permalink. Is it possible that in a few years we might live in Mars? Scientists are definitely trying to find a way to make life sustainable on the Martian surface. But I believe that before we go tho Mars, we have to think a lot about what our own microbes might do the probable life on Mars. It means that Mars is the closest thing to Earth and who knows, maybe one day it will be considered one. Except that it wouldn’t exactly be the same given the fact that it’s probably really cold and the water can be useful for us as well. There would have to be many changes in order for humans to actually be able to live there, but it could be possible. Interesting, maybe some day if we completely destroy Earth we can use Mars as our next home. This discovery will probably help expand human’s horizons as to where future generations may be abel to live if Earth ceased to be habitable. Stephen Hawking has said on repeated occasions that we need to get out of Earth; he has said that we should try to colonize the Moon. It is very interesting that there is flowing water on Mars which means that there is some form of life. But what if bring something to Mars that will ruin the planet? The world may never know. Since Mars is the planet closest to Earth and has the most similar enviroment thankfully in the near future we will be able to send people in order to further study the planet itself. And now we know where to go–were there’s actual flowing water that we can treat, water that we can drink. Maybe in the future organisms like us could live in Mars. We’d have neighbors, people living in Mars. With advances in technology Mars could be another Earth that would sustain life in the future. The lwater is very salty and organisms are likely to live there and could be evolve to bigger greater organims. It would be awesome to be able to viait mars in the future. Scientists should keep experimenting and later in go there and understand it. I suggest yo do research on the concept ‘terraforming’. This is a huge step for mankind since it gives scientists another reason to get people there. Water might also mean that there was probably life up there once which sparks up my interest even more. Just the thought of water in mars brings about an huge amount of moral towards the goal of life in mars. The most interesting part about this discovery is that there is a possibility that we can go to mars and start life ourselfs, we also need to find the perfect way to maintain a stable spurce of water so that we may inhabit mars. There are a lot of moral implications when it comes to science, and space exploration is not an exception. This discovery has been somewhat controversial, mainly because not all scientists agree that we should go there? What reasons might these scientists have for saying that going to Mars is not a good idea? I suggest yo do research on the web to look for the answer. Moral is always a main setback in any decision. As our Mr. Adrover mentioned, there is no exception in space exploration. One conflict that can come to mind is as simple as the temperature fluctuations in Mars. Just because we have found water does not mean the cost of creating habitats that can withstand the tremendous changes in temperature due to Mars’ primitive atmosphere has decreased. Not only that, but it does not guarantee that the mortality rate or failure of the mission will lessen. It all becomes a matter of scientific ethics that must be investigated thoroughly before any decisions are made. What an amazing discovery! If there is water on Mars, there could definitely be water on other planets. Because water is such a huge source of life, there is a high probability of finding martian life on Mars. All of the important biochemical events of life happen on LIQUID water. That’s why this discovery boosts the possibilities of finding life on Mars. In my book, this classifies as the scientific discovery of the century as it is known that major scientific discoveries do not happen so often, as mentioned by our Mr. Adrover. However, I fear that despite its significance in the scientific community, it may not be too significant in the practical community. Let me make myself clear. We now know that Mars does contain brine yet it has been found to emerge only during Mars’ warm seasons. This means that this source of water will not be present throughout the entire Martian year, and life will not thrive there unless it finds a way to endure the long periods of drought. Even extremophiles might not be able to endure the harsh conditions Mars has to offer, from constant changes in temperature to scarce sources of the precious liquid most of us take for granted. 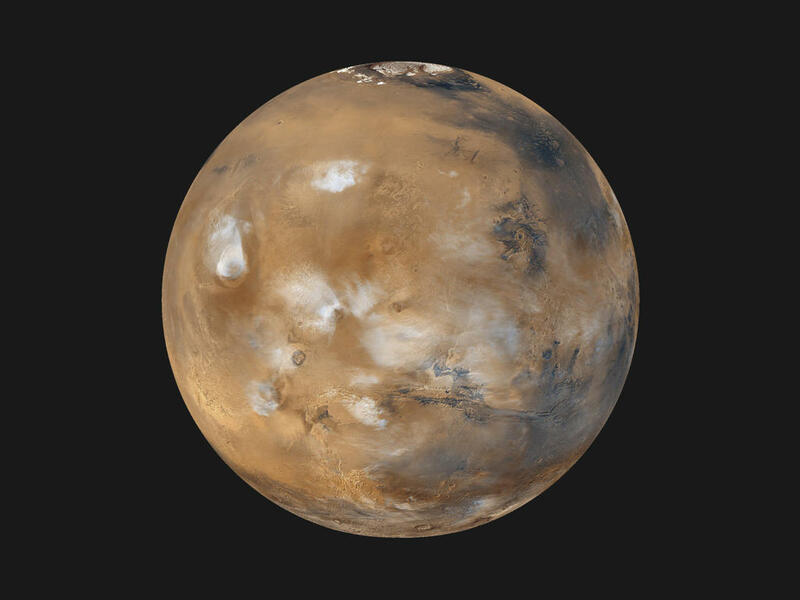 Now, going a bit further into analysis, if we decide to commence populating Mars, the task will prove to be extremely difficult and unlikely to last because we do not have the necessary resources to keep a constant supply of water present, and a large one while at it. Our materials would largely depend on the current water found on Mars, just as we depend on our oceans, lakes, and rivers for our water supply. Until we can find a way to synthesize consumable water, either from water vapor in the atmosphere or completely from scratch in the laboratory, we will not be able to make life on Mars explode with diversity. Nevertheless, this setback does not take away any significance to the discovery nor any doubt that it is an advancement in our scientific society. As we continue to develop new ways of improving life on Earth, we plant the seeds of knowledge that will grow to become the plants and trees on Mars and wherever it is possible in our vast universe. As Stephen Hawking says, Mr. Adrober also said it, humans should evacuate Earth. As we can see Earth is passing through a difficult moment with the extreme levels of pollution. And some scientists have said that if we keep at this pace, Earth will come to an end. With this discovery of liquid water on Mars, it can be an option for the future. But still many tests have to be done and for now it is not even worth it because there are signs that the water is not present all the time. So yes it has been a huge discovery but there are too many questions and doubts left. With every year that passes, life on the poorest regions of our planet is less and less sustainable. Droughts, war, famine, oil, blood. I suggest you do a Google search with the following concepts: ‘Darfur’ & ‘climate change’. SPONCH elements are essential for life on Earth; but knowing that the universe is virtually infinite, and that there are more planets out there than stars—would it be reasonable to think that life will ONLY happen with SPONCH elements? There is a place in California called Mono Lake where its water has unusually high levels of salt. More unusual is the fact that organisms such as Brine Shrimp thrive in this lake. Although our planet has a long history of organisms evolving to adapt for billions of years, I wouldn’t be surprised if we find microbial life in Martian caves for example. I think that even though we can now go to Mars after water has been discovered it wouldn’t be an easy process moving to another planet. First, studies have shown that the journey to Mars could be life threatening because of gamma rays and the amount of radiation that if found. Second, not all humans will be able to travel, especially the low class, because we as a species always give credit to the high class first and third if the journey goes as planned and we build settlements on Mars people will always want more than other and conflicts will arise just like right now on Earth. Saying that we could live in Earth is possible but we as human beigns will make the same mistakes and destroy our new home and go through the same process again. I think that if these elements are found in Mars, it would take many years for us, humans, to live in Mars. NASA has made and exploration strategy to find past and present life on Mars called “Seek Signs of Life”. This strategy will help us know if life ever existed on Mars millions of years ago and if it is possible to have life now a days or if it is possible for humans to inhabit Mars in the future. If we find proteins on Mars, we find the SPONCH elements you are talking about. So my bet is that astrobiologists are searching for organic compounds that have all the emergent properties that proteins show. After reading this blog post, I searched for more information about Mars’s surface. I found an article done by the International Business Times that suggests lakes forming on the surface of Mars. According to studies done by the mentioned source: “lakes of water that could potentially host life could form on the surface of Mars today”. If this is true, then we could be seeing life unravel on Mars (that is, if it currently doesn’t have any). This is a huge discovery for scientists and for ordinary people. This means that life on Mars can be possible if the other elements are present(SPONCH elements). In my opinion, scientists should be looking for other elements in Mars to see if one day we could habitate it. Water is very important for life, but without the other elements we could never live in Mars. They have a pretty good idea of what the Martian chemistry is like; but I guess we’ll never be certain unless we actually go there—this discovery makes that much more possible than before. Water as we know is an essential component for all living things. The discovery of water on the planet of Mars is a very important and significant event for science and its evolution. These findings present a new perspective of life on Mars meaning there could be actual life on this planet. This definitely increases scientists’ expectations to find either present life or past life on Mars. Although water is very important, other certain elements are needed for an organism to grow and develop correctly (SPONCH). I believe that scientists should go and explore Mars and when they reach the salty slopes get some testings to see if the water is highly acidic or not, if it has minerals and or if it has organisms living on it which would definitely point out that there is life on the planet. Who knows maybe in the future humans can be able to live on Mars. I believe that finding life on Mars is more a matter of “when” than “if”—probably one of the biggest “whens” in the history of science. Not too long ago, scientists were discussing the possibility of finding life—not just in Mars—but somewhere in our Solar System, within the next 10 years. Humans have a great ability for self-destruction. Science has proven this and why we, an intelligent species, are nasty and hurtful. Our species will lead itself to its own destruction. When Albert Einstein says “I know not with what weapons World War III will be fought, but World War IV will be fought with sticks and stones” he agrees to our self-destruction. I state this for the sake of our survival the migration of Earth to Mars might be necessary. It might be imperative that scientists find more information and processes that will aid this future migration to become a near reality and learning that Mars has salt water is great start. Scientists are still searching for evidence that proves that complicated life on Mars does exist. Even though they know not if complicated life on Mars exist, they have performed experiments to see if plants can grow on Martian soil. In one experiment, scientists copy Martian soil and grow plants on it. The results of this experiment were astonishing but not completely accurate because they lack some variables like Mars’ gravity and the amount of sunlight the plants receive on Mars. For a video about the growth of plants on Martian ground click on this link: https://youtu.be/Lav4ydRaN7k. Although this is definitely one of the greatest achievements of modern human history, I honestly and respectfully do not believe that it came in the adequate time. This assumption comes from the basis that this discovery is extremely similar to that done when humans reached the moon. Although reaching the moon certainly was another great milestone, by most it was treated like any other discovery done here on Earth. Sadly people only thought of money when they heard that going to the moon was possible. Without the knowledge that we later got from moon exploration, people were already trying to find a way to create a monopoly out of it. It is extremely sad that only few gave it the educational importance that it really had. Treaties were made to protect it, treaties similar to those done in the XV and XVI centuries when discovering the new world. We all know that these treaties will eventually be violated. People rapidly thought of it as a business, and we could all agree that creating a business out of it would create huge conflicts. When I think of this I only fear for the future of Mars. I believe that this planet has great educational potential and can lead to better understanding of the world, but if treated like the moon it could become worthless in the next couple of centuries. I also hope that humanity notices that not everything is meant to become a business. Along with many other things business create competition, this is exactly the opposite of what we need for this project. We need collaboration. The links below show some of the businesses and business-related issues with the Moon. The discovery of water on Mars is a huge step for science and mankind. This discovery can lead humans to think that life can be supported in Mars. This can be assumed because water is very important for living organisms; two of its main functions is in photosynthesis which helps in the making of glucose and in cellular respiration in which glucose is broken down for its stored energy, as learned recently in class. But scientists also need to look at other factors such as the planet’s atmosphere, the temperatures, and the known and maybe unknown elements that can be found, to be certain that life can happen and be completely supported in this planet. And if the proper conditions are discovered and humans invent the technology needed, I think humans should go to Mars. Once humans reach there, they should experiment and discover as much as they can. Who knows, maybe Mars may end up as a second home for humans and certainly huge place for new scientific discoveries. In fact, there are already people signed up for a trip to Mars to establish a human settlement and it is being called Mars One. Link about Mars One: http://www.cbsnews.com/news/a-one-way-trip-to-mars/. On October 5, 2015, a huge discovery for the scientific world was made, water was found on Mars. This means that there is a bigger possibility to believe in extraterrestrial life in another planet, but we won’t be sure of it until we explore. In my opinion, I think we should travel to Mars to undergo investigations and inquiries, but that would take a long time since no human being has ever been to Mars. Due to the amount of radiation found in space and the inability to know how humans will react to it. As we all know, for human life to exist we need more than just water, we need to look for other elements such as the SPONCH elements. We should look in different areas of the environment to see what we may find. People should go to Mars because if we don’t, we will always wonder what it would have been like. Nonetheless, saying it is easier than doing it. In order to go to Mars we have to look at all the consequences and hardships that may occur because of radiation’s unpredictable reaction. Having this in mind, the people who attempt to go should know that it won’t be a simple or easy journey, in the contrary, it will be worth it if we finally reach and step foot on Mars. It wouldn’t be much of a surprise to me if life exists on mars. After all, it has everything necessary for life to be able to survive. We just don’t have the technology yet to be able to prove this 100% but when NASA does prove it, that will change history. Water on Mars is a great discovery but the possibility of us actually living in Mars right now is basically non-existent as we don’t know if the rest of the SPONCH elements are available in Mars and because of it’s thin atmosphere we would get less air and more radiation from space. However that doesn’t rule out the possibility that organisms who don’t require SPONCH elements to survive live or used to live there and though it sounds far-fetched there is actually life on Mars. “We know there’s life on Mars already because we sent it there,” John Grunsfeld, the associate administrator of the agency’s Science Mission Directorate, said during a press conference on Monday. It is a Faustian condition of space exploration that we cannot search for life on alien planets without bringing along very small amounts of very small Earth life. I personally believe that the discovery of liquid, flowing water on Mars is the greatest scientific discovery of the year 2015, if not of the decade. Discoveries like these make me feel grateful to be living in an era in which technology facilitates everyday life and the spread of information is just one click away. Better yet, since it is now a fact that Mars has liquid water on its surface and underground as well, the probabilities of finding life on Mars are rising. Water on Mars has been one of the biggest news of space in the year 2015. One begins to wonder what else could exist and if it’s possible for life to form on this planet. In your class, we saw a podcast of this news and was so surprised at what they had discovered. Scientists have been working on this mystery for many years and now that they know, what is the next step for Mars? The next step is a second robot, even more powerful than Curiosity. After that, actual human beings on the Martian surface. I believe this is a great discovery for mankind as it opens many more questions. Could it be that life could have had existed long ago on Mars? This could even a step closer to say if life could be possible on Mars and if so could we use this to colonise the planet and have water. This is fantastic just to imagine if there is or was life on this planet, because look that living organisms do with water in our planet, maybe it’s not that different on other planets. After all water it’s extraordinary and a basis thing for life. The discovery of liquid water in Mars is a very important advancement in the evolution of scientific works. Since this discovery amplifies our human vision of how human life may exist in other planets making our universe more diverse. Due to this discovery scientist should be more curious to keep on studying the ground on Mars to see if they can find bacteria or fossils. I think that they should do some research to find an efficient way to go to Mars and keep on making interesting discoveries. The fact that liquid was discovered on Mars is a huge discovery for science and for evolution, but as many of my classmates have said, water isn’t the only thing that is essential for us to survive. We need all of the SPONCH elements, sulfur, phosphorus, oxygen, nitrogen, carbon, and hydrogen. Since the SPONCH elements have not been discovered in Mars, then the idea of humans living in Mars is far from being considered. This discovery will hopefully, lead to various other discoveries in our solar system that may also drive us to believe that life can be supported somewhere that isn’t on Earth. This made me think how far we have become, how much we’ve grown as humans. The next step is to build a second robot, which is something truly amazing. This shows how technology has taken a huge part in our lives as we evolve. How we can use technology for our benefit. I think that the most important thing about this discovery is that we now have better chances of exploring the Martian surface. But many questions arise from this: should we go there just because we can? I suggest you do some research on the very interesting debate that is taking shape on the wake of this very important discovery. Human space exploration is dangerous at all levels. After more than fifty years of humans traveling from Earth to space, the risk of space flight is similar to that of climbing Mount Everest. This discovery is a huge step on chances of exploring Mars surface. But since the SPONCH elements haven’t been found then we won’t be able to accomplish our objective. The discovery of water in Mars is an important news in our timeline of our history, something we didn’t know for sure that could be possible. Although, this new discovery is truly fascinating it still doesn’t prove that Mars is capable of sustaining life. There are still components like the SPONCH elements that have yet to be discovered for life to be sustainable in Mars. And also recent news shows that Mars had more carbon dioxide before than it does now resulting in loss of carbon dioxide in Martian atmosphere which in the future could create a problem if we were to live in Mars so there are still many questions to be answered to know if Mars could truly sustain life. The fact that there is water on Mars is huge and brings humanity as a race closer to finding life, but no just in some far away planet, but in our solar system and I come to this conclusion because water is so essential for life as we know that it; even if what we find are just bacteria it is a huge step for the search of intelligent life. It is a huge discovery to actually find water on Mars and as Diego Rivera said in his post, this brings humanity as a race closer to finding life in our solar system. Water is made up of two of our essential elements for life, SPONCH (sulfur, phosphorus, oxygen, nitrogen, carbon and hydrogen). If Mars contains water, this makes scientist wonder and be more curious in their research to find other elements essential to life present in Mars to increase the probability that there exists life on Mars or in a future an organism could survive there. Because global warming is only becoming worst, species and even the human race run the risk of someday becoming extinct. Mars is now a days the closest thing we have to Earth and in the future, who knows, maybe if the necessary elements are found, the possibility of humans living on Mars could exist. I think this is a remarkable finding for the human kind and the world of science. I also think that this might be possible because of the fact that particles from Earth have moved to Mars as to other parts of the universe, I think that we are connected with the universe somehow in a way other than our location. We must be sharing a part of our particles with the rest of the universe just like the universe with Earth. In my personal opinion I think Mars might be on the way to have life and to me it should be almost like ours here in Earth. I believe Mars and Earth are so alike! And since it is water just like us then the life there should be quite similar. I also think that just because there is water does not mean there is lofe though but it does mean that it might be in their way to happen eventually. The discovery of water in Mars is definitely a huge accomplishment for us. The chance for us to find life is greater, but I think even if we find SPONCH elements, there might not be life other than maybe archaea, because Mars does not have a magnetic field protecting it from solar winds, which are radioactive. The discovery of water on Mars is one of the most important scientific discoveries made in the 21st century. Water is one of the most important things needed for life to work. This discovery opens doors for the future and on the possibilities of finding life on this planet. Water may be very important but there are other elements that are needed for life which are the SPONCH elements. When scientists finally go to Mars in the future they should investigate and try to find these elements. Maybe in the future humans will be able to live in this incredible planet. Astrobiologist all agree that water is key to finding life on another planet and with the discovery of water in Mars I believe that there is life or if their is not that it is capable of maintaining it . The planet today is dry and barren, with most of its water locked up in the polar ice caps. If life exists on Mars today, it is likely hiding beneath the surface, perhaps hiding in a shielded water source. The discovery of liquid water in Mars is a very important advancement in the evolution of scientific works. Since this discovery amplifies our human vision of how human life may exist in other planets making our universe more diverse. Due to this discovery scientist should be more curious to keep on studying the ground on Mars to see if they can find bacteria or fossils. I think that they should do some research to find an efficient way to go to Mars and keep on making interesting discoveries. Like in this website it says that they think that life could have existed there. The implication that there is water on Mars means that we could possibly one day inhabit the planet, whenever we find ourselves in a dire situation here on Earth. Apart from the fact that there is water, all we would need to know is if the barren terrain would allow us to plant crops and thus sustain life there. According to this website, researchers have attempted to plant crops in similar terrain, next to a volcano in Hawaii and proved that it is indeed possible. Now we just need to go over there and try it for ourselves! I was reading an article, and it mentioned that there is evidence that billions of years ago in Mars there were oceans and rivers everywhere, but since it has less gravity and a thinner atmosphere as water evaporated more and more of it escaped into space. This made me think that maybe billions of years ago there was some kind of life on Mars, maybe very simple forms of life, but life nonetheless. Since I was curious to know if I was right, I searched on Google and found this article about it. It says that in the John Klein area there is evidence that it had many of the elements needed for life including sulfur, phosphorus, oxygen, nitrogen, carbon, and hydrogen. This means that there is a possibility that there may have been life on Mars. Know I am probably going to be very attentive to any news from NASA on Mars to see if this hypothesis could have any truth to it. Water is very important for life. The recent discovery of liquid water on Mars is very significant for science. This is one of the greatest achievements of human history. From this discovery it can lead it can lead to humans to think that life in Mars is possible. Liquid water is very essential for life but other elements like the SPONCH elements are also important. Scientists will keep investigating if life is present on Mars. Water is one of the vital necessities needed for humans to survive. Without it, there is no chance of survival. After NASA showed evidence of liquid water flowing on Mars, scientists have considered the possibility of humans having a chance to visit or live on Mars. This discovery opens up doors for many different opportunities and discoveries waiting to be made. I believe that with this evidence found we can explore more in regards of Mars and human’s chance to be able to go to Mars. “Mars One” is an organization based in the Netherlands that has proposed to land the first humans on Mars and establish a permanent human colony there by 2026. With this new discovery, there is no doubt that this mission was supported, and that there may be more planets out there (exoplanets, specifically) that can host human life. With the discovery of liquid water on Mars can set us one step closer to finding life outside of Earth. NASA has launched many rovers to study the martian surface and it has found some remarkable things. Scientist are now figuring out a way to send humans to Mars and study the things rovers can not. Space agencies like for example, NASA, Space X, and ESA are trying to make this happen, probably causing a new Space Race. Although there is water, there are more things needed to sustain life. However, in the future, Mars could be terraformed making it possible for humans to live normally on the planet.